Trivium School occupies a beautiful, 12-acre country estate two miles from the center of Lancaster, Massachusetts, and 40 miles west of Boston. Students attend most classes in the large main house, in rooms rich in architectural detail. A beautiful oak-paneled living room now serves as the school library. The grounds have two soccer fields and a volleyball court, and there are trails in the woods around the School. The main building was called “Crownledge” because it was built at the high point of the rocky ledge on the property. 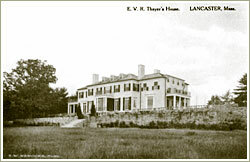 It was the home of Eugene V. R. Thayer, Jr., built for his first wife, Gladys Brooks, in 1909. They were married in Newport, R.I. with only 3,000 of their close friends and relatives present. The Worcester Telegram reported that Mr. Thayer plans to build a “palatial home, to cost in the vicinity of $200,000,” as his “magnificent country seat.” Some historians have speculated that Ogden Codman, Jr., did the interior decorations. The architects, Bigelow and Wadsworth, were an important Boston firm. They worked on St. Mark’s School, the American Antiquarian Society, parts of the Boston Athenaeum, and the Fifth Meeting House in Lancaster, originally designed by Charles Bulfinch. 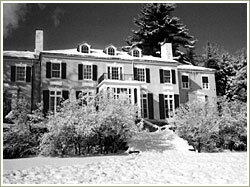 The property was sold several times and finally bought in 1979 by Mr. and Mrs. John Schmitt. They established Trivium School that year, and the School opened October 25, 1979. In 2000, the property was purchased by the School. In 1990 the School Chapel was completed and the Bishop of Worcester presided over the dedication. 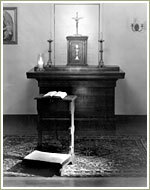 The students and faculty attend Mass as a School once a week at Trivium or at a nearby Benedictine monastery. The latest addition to the Trivium campus is an arts and athletics building, housing space for art and music classes as well as a full-sized basketball court. This building is the site for games, dances, concerts, and play productions.